S&T efforts should create a supportive environment for innovation and development and should address the needs of the society for improving quality of life says Niti Aayog’s Three Year Action Agenda (2017-18 to 19-20). Marching towards in this direction, the Government of India has embarked upon an initiative to operationalise nine missions of national importance to leverage cutting edge scientific research for societal benefits. The nine missions span across artificial intelligence, human health, biodiversity conservation, waste management, expedition of the blue frontier/deep sea exploration, amalgamation of S&T innovations, energy-efficient electric vehicle, language translation, and quantum computing. Each mission is being led by the lead ministries, concerned agencies and government departments. 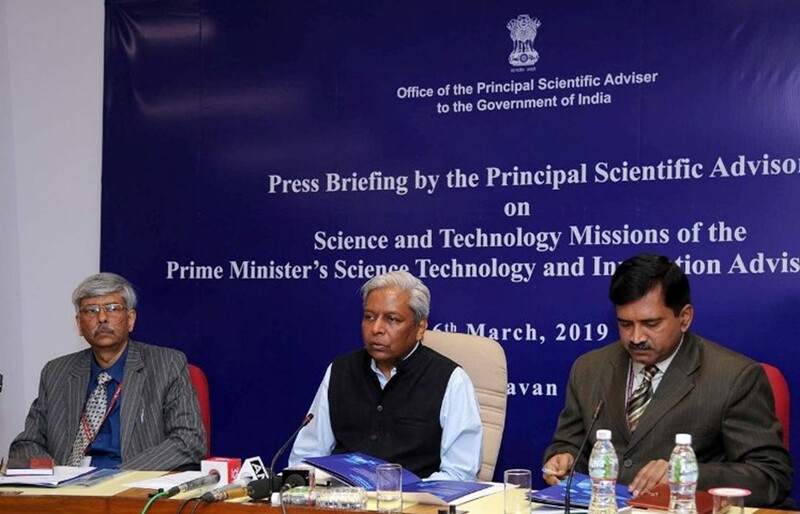 Recently, the details of the nine mission mode projects guided by Prime Minister’s Science, Technology and Innovation Advisory Council (PM-STIAC) were announced by the Principal Scientific Adviser to the Government of India, Prof. K. VijayRaghavan, at a press conference in New Delhi. The artificial intelligence (AI) mission has been formulated to benefit the nation in addressing societal needs in areas such as healthcare, education, agriculture, smart cities & infrastructure, including smart mobility and transportation. In view of building international collaborations, further, the mission aims to work with extensive academia-industry interactions on developing core research capabilities. It will focus on technology frontiers in developing and deploying applications through the creation of new knowledge. The mission is under the ambit of Ministry of Electronics and Information Technology (MeitY), Department of Biotechnology (DBT), Department of Science and Technology (DST), and NITI Aayog. Aiming to reduce fuel consumption and further increase indigenous vehicle sub-systems, and demonstrating its value in terms of emission mitigation are the prime objectives of the mission on Electric Vehicle (EV). The fulcrum of this mission is to develop energy efficient vehicle and components for Indian requirements with enhanced output with a view towards using recyclable material and efficient batteries that function well in domestic conditions. The lead agencies for the mission are Department of Heavy Industries (DHI), Ministry of New and Renewable Energy (MNRE), Ministry of Power, DST, and NITI Aayog. Aligned with the action plan for Swachh Bharat and Smart Cities projects, the mission on waste-to-wealth envisions identifying, developing and deploying new technologies for better use of waste. The mission is aimed to scout viable circular economic models for a clean and green environment. Ministry of Housing and Urban Affairs (MoHUA), Swachh Bharat Abhiyan, DST, DBT, and MOEF & CC are the regulatory bodies of this mission. Under the guidance and support of the Principal Scientific Adviser (PSA) to the Government of India, mission AGNIi (Accelerating Growth of New India’s Innovations) will play a pivotal role for science-tech-innovation in the country by connecting innovators across industries, individuals and the grassroots to the market. The mission led by Invest India focuses on providing a platform to budding innovators to commercialize their market-ready products. The mandate is to help propel India into a new era of inclusive socio-economic growth. With a mission to position India as a pioneer in the area of health and disease diagnosis, the mission on bioscience for human health sets out to address better diagnosis and treatment for rare and inherited diseases by identifying their genetic basis. The primary goal of the mission is to construct comprehensive reference maps of genomes and to understand the dynamics of how exposure to different environments has an impact on our bodies. Department of Health & Family Welfare (MoHFW), Department of Health Research (DHR), DAE, DBT, and DST are the governing bodies of the mission. The mission on deep-ocean exploration focuses to scientifically explore and understand the deep oceans with a view to harness living and non-living resources that still remain untapped. Information gathered from the mission is expected to help address the disproportionate impact of climate change on the ocean. The lead agencies for the mission are Ministry of Earth Sciences (MoES), Oil and Natural Gas Corporation (ONGC), Geological Survey of India (GSI), National Hydrographic Office (NHO), National Biodiversity Authority (NBA), DBT, DoS, MNRE, and DRDO. Under the umbrella of the Ministry of Human Resource Development (MHRD), DST, and MeitY, Natural language translation mission aims to remove the language barrier of high-level of the facility in English poses today. The plan is to set up an eco-system that involves central & state-government agencies and start-ups to work with scientists towards building implementable solutions. It puts forth the idea to ensure that progress in science and technology (STI) is accessible to all. The mission on quantum frontier aims to initiate work in control of the quantum mechanical systems and building excellence through the development of quantum computers, quantum chemistry, quantum communication and quantum sensors and another to create new knowledge and develop and deploy applications in the area of artificial intelligence. The lead agencies for the mission include the Defence Research and Development Organisation (DRDO), Department of Space (DoS), Department of Atomic Energy (DAE), DST, and MeitY. The national biodiversity mission is working on comprehensive documentation of India’s biodiversity conservation and distribution with the potential for cataloguing and mapping all life-forms. The mission aims to develop a cadre of professionals competent to handle environmental data for management and monitoring of vibrant biodiversity by implementing knowledge ecosystem. The lead agencies for the mission are the Ministry of Environment, Forests and Climate Change (MoEF & CC), and DBT. Prime Minister’s Science, Technology and Innovation Advisory Council (PM-STIAC) aims to facilitate technology and innovation for addressing frontier scientific challenges and identifying solutions for societal problems. The council envisages implementing country’s STI futuristic roadmap through mutual policy learning, accessing status in specific science and technology domain and international facilitation and cooperation. Visit http://psa.gov.in/pmstiac-missions for additional information.